Time for awards of a different caliber. There aren’t that many student-athletes who manage to successfully transition into the world of musical theater, but Brown alum Daveed Diggs (Brown ’04) has done so. The former Bruno high hurdler has been involved with the current Broadway breakout hit of “Hamilton“, a modern-day adapted biopic about the first Secretary of the Treasury. Diggs originated the dual role of Marquis de Lafayette and Thomas Jefferson, which requires him to perform the fastest rap in Broadway history (where Diggs is described as “a nasally, sibilant and extremely fast rapper—imagine Eminem high on Adderall and elocution classes” by the Observer in March 2016). And now, he is a Tony Award winner for Best Feature Actor in a Musical for those roles. At first, Diggs didn’t believe that the premise of the biopic about Hamilton done in the style of rap would work. He told the creator – Lin-Manuel Miranda – so back in 2013 when Miranda pitched the idea to him after Miranda heard Diggs perform in an experimental hip-hop collective routine during a ESPN SportsNation segment as a part of that year’s Super Bowl coverage. But once Miranda sent him a copy of the music, Diggs was hooked and has been involved with the show since it’s 2013 Vassar Workshop days. He is currently one of three actors – including the creator Miranda – who has portrayed the same role since 2013. Earlier this year, the cast won a Grammy for Best Musical Theater Album. Tonight, the show entered the Tony Awards with the most nominations in show history – 16 – and walking home with 11 trophies at the end of the ceremony. “I had never done Broadway before and I didn’t really think I was doing Broadway. I didn’t aspire to be on Broadway,” Diggs shared in the Observer article. And yet, this theater major and former school record holder is now a Tony Award winner, something he could not have done without the support of his parents for advocating going down the path that not everyone else was doing. “When I was in preschool, we were supposed to do a performance for the parents and I didn’t want to do it. My mom talked to teacher. She came back. She said “you don’t have to do it but you have to do something” and I said “I want to do a gymnastics routine with my dad”. A couple of days later, my dad showed up with me in matching rainbow tights and we did this gymnastics routine in front of the parents at the preschool. And the important thing about that story to me is that one, my mom gave me permission to do something that everybody else wasn’t doing and two, my dad supported me and made it possible. 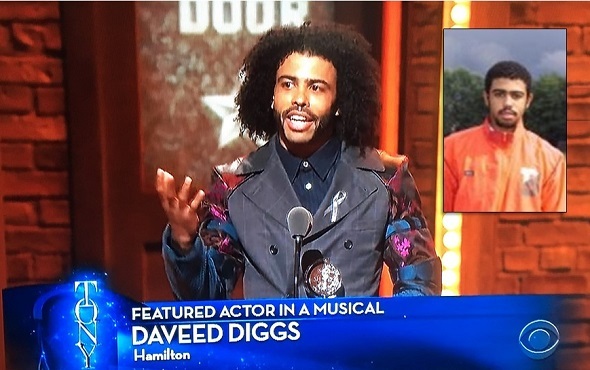 And, I think a lot of us are here because people in our lives did that, so thank you mom and dad…” Diggs shared in his Tony acceptance speech. Congrats, Daveed, and keep on doing stuff that everyone else is not doing. This entry was posted on Sunday, June 12th, 2016 at 8:17 pm. It is filed under Alumni, Spotlight. You can follow any responses to this entry through the RSS 2.0 feed.